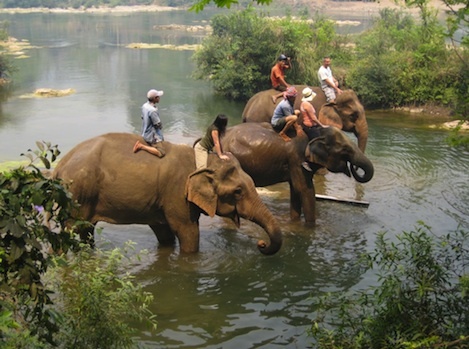 Explore Laos and travel from Luang Prabang to Vientiane in the via Vang Vieng. 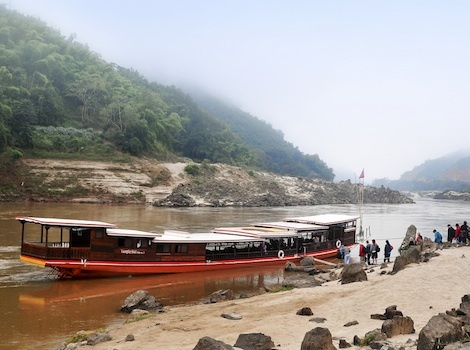 A beautiful voyage on the Luangsay cruise across the Mekong River from Luang Prabang to Houei Sai where you can enjoy the breath taking nature and experiencing the local culture. 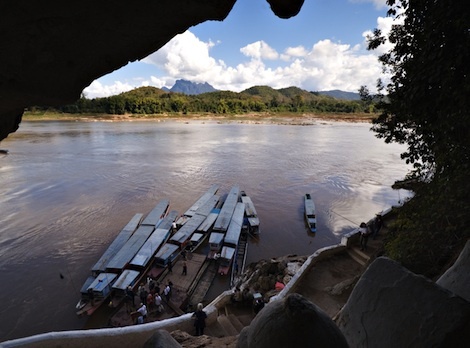 The cruise departs in Luang Prabang and will sail to Houei Sai or the other way around. Kamu boat leaves Kamu pier at 9a.m. for cruising up the Mekong River to Kamu Lodge. The boat first stops opposite the mouth of the Nam Ou River to visit Pak Ou caves where there are two caves ‘Tham Ting’ and ‘Tham Phoum’ and thousands of Buddha images. Then, the boat arrives at Kamu Lodge so you will be able to check in and have lunch at the open air restaurant. 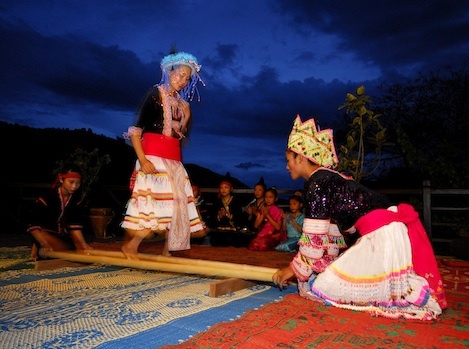 In the afternoon, you can participate in different activities such as; visiting Kamu village, archery contest, rice planting and harvesting, traditional fishing and gold panning (January to June). A set menu dinner is served and you will stay overnight at Kamu Lodge. A continental breakfast is served at the restaurant from 7a.m. After relaxing awhile, Luang Say boat will pick you up around 10a.m.-11a.m. in order to cruise up to Pakbeng. A buffet lunch is served on board and the next stop is at Ban Baw to observe the local village‘s way of living. 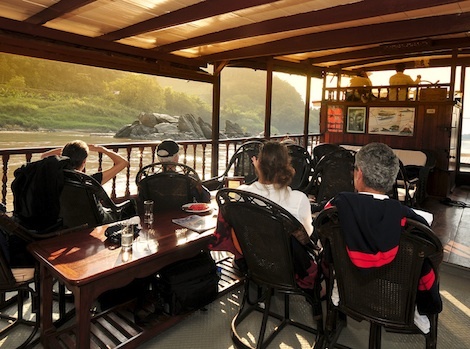 The boat arrives at Luang Say Lodge before sunset for an overnight stay and a dinner is served on the terrace overlooking the Mekong River. A continental breakfast is served on the terrace from 6a.m. The boat leaves Luang Say Lodge at 7a.m. One stop is made en route to Houei Sai to observe a rural life along the Mekong River at Ban Houy Phalam; a Kamu village. A buffet lunch is served on board. The boat arrives at slow boat pier in Houei Sai before 5p.m. (it is possible to continue your journey to Chiang Rai, Thailand the same day). Luang Say boat leaves slow boat pier at around 9a.m. 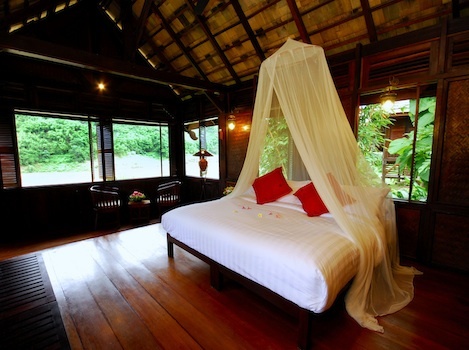 for cruising down the Mekong River to Luang Say Lodge in Pakbeng. One stop is made en route to Pakbeng to observe some rural life along the Mekong River at Ban Houei Phalam; a Kamu village. A buffet lunch is served on board. The boat arrives at Luang Say Lodge before sunset for an overnight stay and a dinner is served on the terrace overlooking the Mekong River. A continental breakfast is served on the terrace from 7a.m. The boat leaves Luang Say Lodge at 8a.m. and the first stop is at Ban Baw village to observe the local village‘s way of living. A buffet lunch is served on board. Then, the boat arrives at Kamu Lodge around 2p.m. so you will be able to check in and participate in different activities such as; visiting Kamu village, archery contest, rice planting and harvesting, traditional fishing and gold panning (January to June). A set menu dinner is served at the open air restaurant and you will stay overnight at Kamu Lodge. A continental breakfast is served at the restaurant from 7a.m. Kamu boat leaves at 8a.m. and stops opposite the mouth of the Nam Ou River to visit Pak Ou caves where there are two caves ‘Tham Ting’ and ‘Tham Phoum’ and thousands of Buddha images. The boat arrives in Luang Prabang at Kamu boat pier (a UNESCO world heritage city) before lunch. A lunch set menu is served at a local restaurant. When booking this cruise, please inform us which direction you prefer.